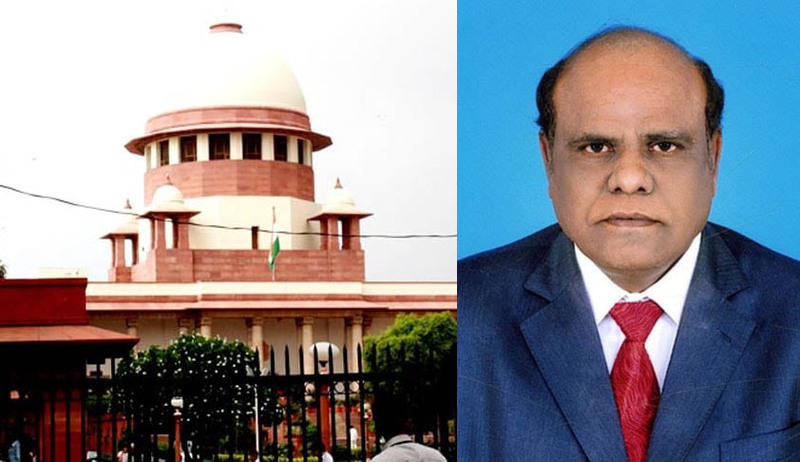 The first hearing by the seven-Judge bench of the Supreme Court of the suo motu [civil] contempt case against the Calcutta High Court Judge, Justice C.S.Karnan, began at Court No.1 at 10.30 AM with the Court packed to full capacity. The bench heard the Attorney General, Mukul Rohatgi, who said the contents of the letter written by Justice Karnan to the Prime Minister, on January 23, against the sitting Judges of the Madras High Court and the Supreme Court are indeed scurrilous, and could constitute criminal contempt. AG also said "Time has come to take an action and set an example.People of the country must not think that the judiciary can't take an action against its own judges." The Apex Court has the power to initiate proceedings under Article 129 and award punishment under 142(2) of the Constitution. "Facts are not such that there needs to be any verification of transaction but slanderous remarks in letters against the High court and Supreme Court judges in letters circulated," he said. Chief Justice of India, Justice J.S.Khehar, who presided over the bench, said the issue has to be dealt with cautiously, as any decision which the bench takes, would set a precedent for the future. Hence, there is abundant need to be extra careful, he said. Thereupon, the CJI dictated the order saying, Justice Karnam be issued notice to explain why contempt proceedings should not be initiated against him, and also appear personally before the bench on February 13. CJI Khehar, while dictating the order has removed the word 'Hon'ble' to address the judge. The bench also directed withdrawal of all judicial and administrative work from him, and asked him to return all the files pending with him to the Registrar General of the High Court. It is interesting that the Court has chosen to proceed step by step against Justice Karnan. Although prima facie, his letter to the Prime Minister making scurrilous allegations against the sitting Judges could constitute criminal contempt - as it affects the administration of justice, by bringing the judiciary to disrepute among the public - the case was listed today as a suo motu civil contempt matter, not criminal. Obviously, at some stage, the matter has to be categorised as a criminal contempt matter also, going by the proceedings today. As a civil contempt matter, it appears, the Court confined its today’s directions to withdrawal of his administrative and judicial work, and return of files pending with him. The Madras High Court has complained about his refusal to return 12 files to it, after his transfer to Calcutta high court. The Madras High Court had also complained about his non-vacation of the accommodation allotted to him in Chennai. It remains to be seen whether today’s order would ask him to vacate it expeditiously. It also remains to be seen whether the seven Judge bench will confine itself to his latest scurrilous letter to the Prime Minister, and widely shared in the social media, and leave other matters regarding his challenge to the transfer from the Madras High Court to Calcutta High Court currently heard by a bench of three Judges. Observers expect that the seven Judge bench will hear all the related matters together. The size of the bench, constituted to hear the case, is also indicative of the seriousness with which the Supreme Court has dealt with issues of contempt of court, which are on the rise. In the past, allegations have been made by senior advocates of the Supreme Court regarding former Judges. The Supreme Court did take suo motu criminal contempt of those allegations, and issued notice, and heard them. But nothing came out of it. Therefore, it appears that the Supreme Court is making a distinction between scurrilous allegations against former and current Judges, and is initiating contempt proceedings seriously, only with regard to those made against the current Judges.